One of the things we like to do as family during the holidays is drive around our community and look at all the Christmas lights and displays. Some people really put a lot of effort into their decorations, and it's really neat to see houses lit up from top to bottom. But, my very favorite displays are ones that include a nativity scene. Last week, our pastor's sermon spoke of the importance of keeping our eyes fixed on Jesus. With all the hustle and bustle during Christmas, it's easy to lose focus. However, every time I see a creche, I am reminded of the true meaning of Christmas and the best gift ever, the birth of Jesus, our Savior and redeemer. This week we are reading a couple picture books that portray nativity sets. Both books would make neat gift companions to a child's nativity set. On a snowy Christmas Eve, a little child's family wishes baby Jesus and all the visitors to the manger goodnight, one by one. "Goodnight to the baby in the hay. Goodnight to the doves, coo coo. Goodnight to the sleepy mother. Goodnight to Joseph, too." The simple story, told in rhyming verse, helps introduce young children (toddlers and preschoolers) to the Biblical Christmas story and encourages them to name all those who played a part in witnessing the glorious birth. Sarah Jane Wright's adorably cute illustrations put the past and present into prospective, first showing images of the holy family and visitors at Bethlehem and then switching focus to a present day family who lovingly place baby Jesus in their Nativity set manger before getting ready for bed on Christmas Eve. The last image on the copyright page shows only a swaddled baby Jesus, a nice touch alluding to the central focus of Christmas. My kids especially like to point out the stuffed animal lamb the child in the book holds while sleeping and the little church in the final landscape illustrations. Due to the simplicity of the text, the book is best for very young children. A Christmas Goodnight Activity set [pdf] and Nativity Puppet Theater [pdf]. A little mouse named Mortimer is unhappy with his dark, dismal home underneath the stairs. He sees a perfect little "house" set up near the Christmas tree. He makes himself at home and settles down to sleep on a bed of hay after pushing the statues out of the way. Unfortunately, day after day, when he is out and about, someone replaces the statues in the house. Eventually, on Christmas Eve, he learns more about the statues and Jesus, a baby "born to save the world." Mortimer makes room for Jesus, remarking, "There was no room for you in the inn. But I know where there is room." After praying, Mortimer discovers a suitable home for himself. Wilson's sweet story shows that everyone is important to God and focuses on the true story of Christmas, by spreading the word about the Savior, Jesus Christ. Karma Wilson also paired together with Jane Chapman to create the popular "Bear" books, and the illustrations in Mortimer's Christmas Manger are similar in style, full of lovely details and warm scenes. Mortimer is such an adorable mouse; he couldn't possibly be any cuter! My kids especially like to remark on all the decorations pictured on the Christmas tree (some of which Mortimer knocks down while trying to reach the creche.) This is a longer, but well-told story that keeps a child's interest and helps teach about the birth of Jesus. Looking for a book that portrays a live, outdoor nativity? 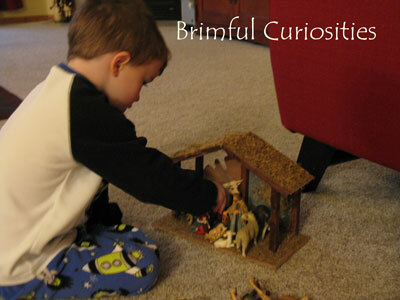 Last year I featured Lauren Castillo's book, Christmas is Here on Brimful Curiosities. It's a beautifully illustrated version of the Biblical text, Luke 2:8-14. Click the link for my full review. What other books featuring nativity sets do you recommend? We'd love to read more picture book stories like the ones above. Did you know there's another Mortimer book? That one is about sunflowers. It's equally cute and compelling. Great list! I know we've read the Mortimer book, but I don't think we've seen the others. We also really like the animated Christmas story - "The Very First Noel", with Andy Griffith narrating from the point of view of a wiseman. It starts out in a Nativity scene. Thanks for the suggestions and linking up to The Children's Bookshelf. I haven't read these two, yet and I love getting new book titles to look for. Thanks for this list! We will have to check out some of these books. Do you enjoy Sally Lloyd-Jones. I know that she has written a nativity book too which I haven't read yet but I'm sure is wonderful based on her other books. Thanks for linking up to The Children's Bookshelf too!